In this post, you will find player statistics for Dolphins FC, Kwara United FC and Shooting Stars FC after Week 7 of the Nigeria Professional Football League 2013. * When a player has played “0” matches, this means that he has been on the bench for at least one match during the Nigeria Professional Football League 2013. * Please note that I am currently missing information about substitute appearances in the Week 3 match against Sharks FC on 24.03.2013. * Please note that I can only document one subsitute appearance in the Week 5 match against Rangers International FC on 31.03.2013 (Stanley Dimgba). * Please note that I am currently missing information about substitute appearances in the Week 1 match against Gombe United FC on 10.03.2013. * Please note that I can only document two subsitute appearances in the Week 3 match against Lobi Stars FC on 24.03.2013 (Moses Ogaga and Okiki Afolabi). 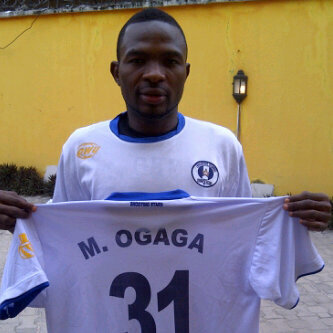 The picture is of in-form striker Moses Ogaga and was found on naijaligue.blogspot.com.